South Africans celebrate Freedom Day on the 27th April. This year I will be celebrating Freedom Day by feasting with family and friends. The idea of marking the day with a feast came to me while reading Anna Trapido’s book, Hunger for Freedom. The book also reminded me of South Africa’s food heritage and particularly Madiba’s love of all things spicy – pickles, breyani and even crab curry are just some of the recipes featured in the book. There are many stories that are beautifully written – stories that tell us about people, the food they prepared and the meals they shared. Indian food has long played an important part in the development of a South African food culture. Our nation’s love of strong spicy flavours and chilli is part of our heritage. Everywhere you go in South Africa, there is Peri Peri, Garlic, Chutney, Dips and generally robust flavours. Those of you who have travelled widely will know that this is not always the case in other countries. Try to find a traditional Durban Curry in India – you can’t! And don’t think that South African Indians grew up on Rogan Josh, Korma and Vindaloo – we grew up eating curry and rice! Ever been to an Indian wedding – I just know that you were served breyani, breyani and more breyani cooked in the biggest pot you have ever seen. My point is that South African food is not based on fancy schmancy recipes, but rather on good wholesome spicy food. We grew up eating curry cooked in AMC pots every day, but every now and then one of the many great cooks in the neighbourhood would break out with something different for example Malva Pudding, Milk Tart and Bobotie. It was always like a breath of fresh air, and although we might have immediately gone back to our Durban curries, the memory of those ‘adventures’ has always stayed with me. I still try to relive those adventures in my cooking, although Durban Curry will always have a special place in my heart. Here are two of recipes that I will be preparing for my Freedom Day Feast…. 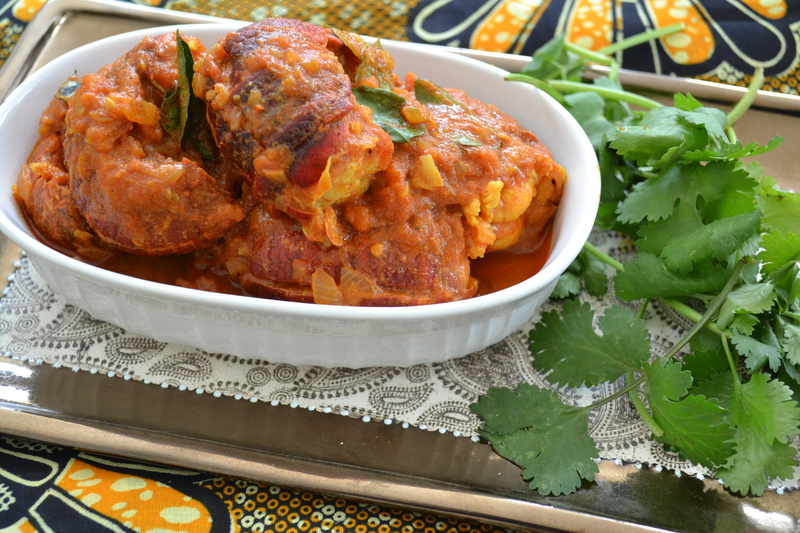 One of Madiba’s favourites, Crayfish Curry – this is how I make it! If you are using fresh tomatoes, blanch them in boiling water. Remove the skins and chop. I used the tinned variety for this recipe simply because I was out of ripe tomatoes and the ones in the veggie basket were too firm to make up a good sauce. Chop the tinned tomatoes and remove the hard centre. Heat the sunflower oil on medium. Add the onions, salt and curry leaves. Saute until the onion is light golden brown before adding the garlic. Saute the garlic for a few seconds until fragrant and then add the red chilli powder. Stir for 5 seconds and then add the tomatoes. Cook until the tomatoes soften and add the cumin, coriander, turmeric and sugar. Reduce the heat and simmer for until the sauce thickens slightly. Add the crayfish tails and simmer until the shells change colour. When the tails curl slightly and the meat is cooked, remove the pot from the heat and add curry leaves. Add the fresh coriander and serve with basmati rice. I leave the crayfish in the shell – it adds more flavour to the sauce. Preheat oven to 180 degrees celsius. Grease an oven proof dish with non stick spray. Sieve the flour and bicarbonate of soda twice. Stir the salt into the sifted dry ingredients. Combine the melted butter, full cream milk and the cream. Crack the eggs into a mixing bowl. Use a hand held beater, and beat the eggs while gradually adding the castor sugar. Continue beating the eggs and sugar until light and fluffy. Beat in the sifted dry ingredients, alternating with the milk and cream mixture. Lastly add the apricot jam and the vinegar. Beat well ensuring the mixture is smooth. Pour the batter into the prepared dish and bake for 30 minutes or until golden brown and set. Combine the cream, butter, castor sugar and boiling water. Simmer the sauce on low for a few minutes until the sugar dissolves and the sauce thickens slightly. Pour the hot sauce over the baked pudding as soon as it comes out of the oven. 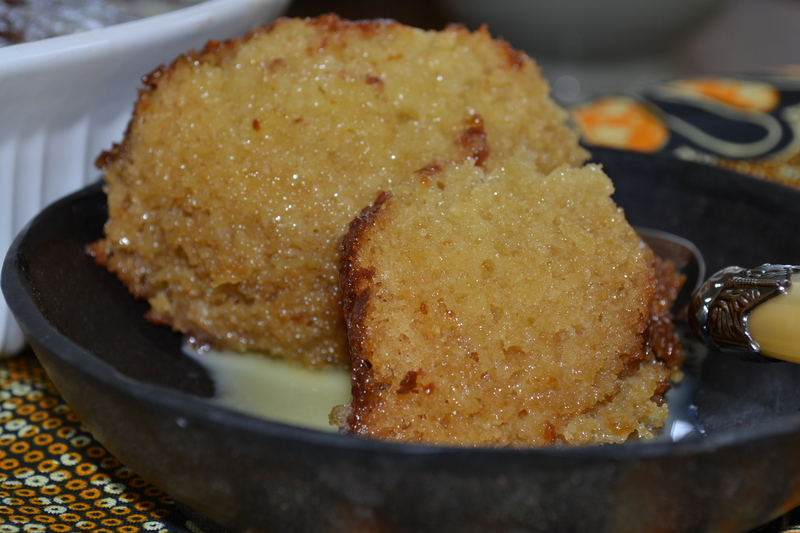 Serve the malva pudding warm and topped with ice cream or custard. Use 150ml full cream milk instead of a combination of full cream milk and fresh cream for the pudding. Whipped cream can be served with the pudding. Food and thoughts of food trouble me…they constantly tempt and tantalise me. My job does not make it any easier with always being around such delicious foods and aromas. A few weeks ago, I was asked by Pat Tarr to assist with the food styling for a Spar photo shoot. Lots of shooting unfortunately means lots of eating. Fortunately, I love eating and this makes me love my job. Everyday brings a new foodie adventure. Before you read on, please remember that these recipes and posts are not sponsored by Spar. The recipes developed have been mainly around the products that I sample while doing my in store promotions. I have a range of products in Spar and over the years have developed many relationships with the store managers and owners. I have also found many foodie friends at Spar. The first shot on the list was of a Spar Cream cheese and the second one was smoked salmon. Pat had mentioned that the cream cheese was delicious but I thought how much better could it possibly be? The team decided to take a break and the salmon bruschetta looked too delicious to resist. It was heavenly and somewhere between my first and second bite, my mind began to race. Where else could I use this cream cheese? I could not resist the other variants in the range which were the Sweet Chilli and the Fig! It was not just slightly better than the other ones I had tried – It was head and shoulders above! It was the plain variety, however that caught my attention…the possibilities were endless. Far too often, I have heard complaints about cream cheese frosting turning into a curdled mess. Its happened to me a few times and its simply heartbreaking. I was determined to test this cream cheese because it made so many promises to my taste buds. But would it work? And so the temptation began…. I am not a dessert fan….give me a plate of curried mince samoosas any day and I could happily munch away. But this cheese really got me going. Carrot Cake? Red Velvet? No!!! I needed something new to satisfy my fantasy. Most of the dishes I prepare are generally a result of some craving. 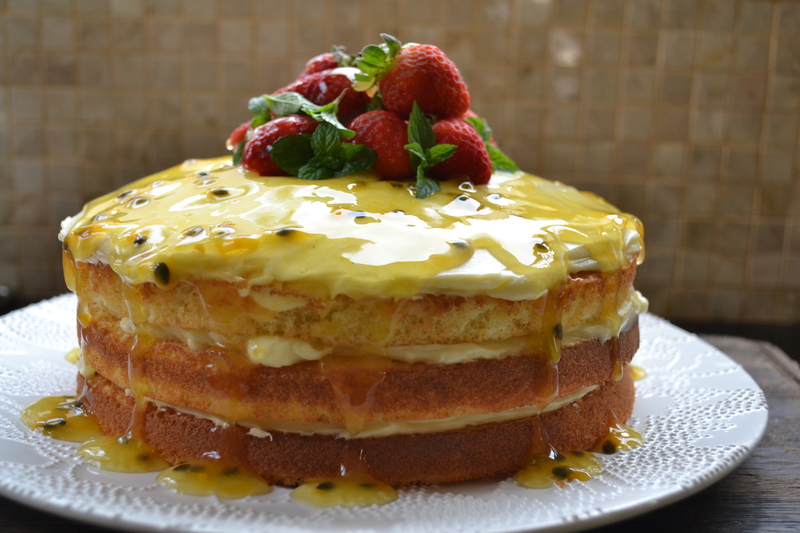 Weeks of thought and wandering aimlessly around the supermarket aisles thinking of flavours and textures resulted in an insatiable desire for a Passionfruit Cake. Preheat the oven to 170 degrees celsius. Grease and line 3 x 20cm cake tins. Sift the self raising flour five times. Add the salt to the sifted flour and set aside. Place the eggs into a mixing bowl. Beat the eggs with a hand held beater for a minute. Gradually add the sugar and beat until the mixture triples in volume. Fold in half the sifted flour and repeat with the other half. Add the passionfruit pulp and melted butter. Fold the mixture again and ensure the ingredients are well combined. Divide the batter between the 3 tins and bake for 10 – 12 minutes. The cake should be light golden brown and should come away from the sides of the tin. Remove from the tins and leave on a wire rack to cool. Place the butter into a mixing bowl. Beat the butter with a hand held beater and gradually add the sifted icing sugar. Continue beating until the butter is light in colour. Pour in the cream and whisk for a few seconds. 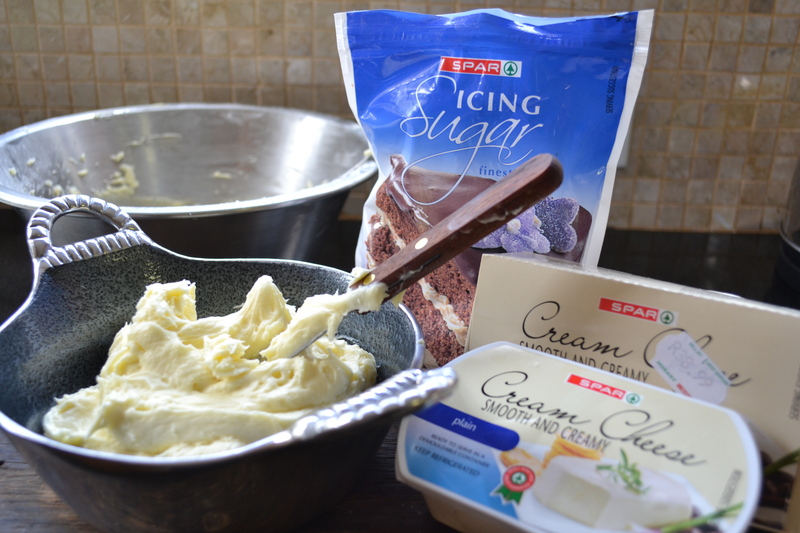 Ice each layer with a third of the cream cheese frosting. 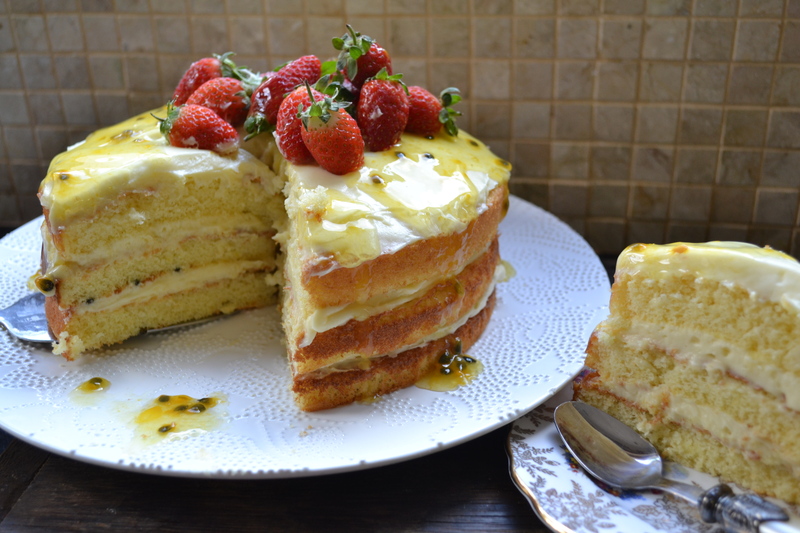 Garnish with strawberries and mint sprigs. Avoid the budget brands and the high moisture content will cause the frosting to split. The butter should be softened but not warm. The best way to describe it as cold but at room temperature. Do not overbeat the cream cheese as this can cause the frosting to split. Add the cream cheese only when the icing sugar and butter are ‘married’. Want to learn how to make quick and delicious meals, check out my videos on you tube! Trouble follows me….My workload has been growing and my troubles have also been growing…more about that some other time. The growing workload and not having a day off in about two months has made me a little grumpy – I sometimes think if it wasn’t for my fabulous speedy dinners, I wouldn’t have any fans at home! On a positive note, I was asked to be the guest chef at the Hobart Superspar in Bryanston. I go into the store three times a week and cook up exciting new dishes. Its been a blast. Its also reminded me how much I love the buzz of a commercial kitchen. Boy, do I miss my happy restaurant days at Salaam Bombay where everyday was a new adventure! The best part of being a guest chef is I get to try loads of new products and experiment with them too. One of these products has been tinned tomatoes. I have never been a fan of the tinned tomato but have been using them at the Spar due to a shortage of good, ripe fresh tomatoes. Tomatoes are obviously one of the most important ingredients in preparing a delicious curry and I was pleasantly surprised that the Spar tinned variety works really well. 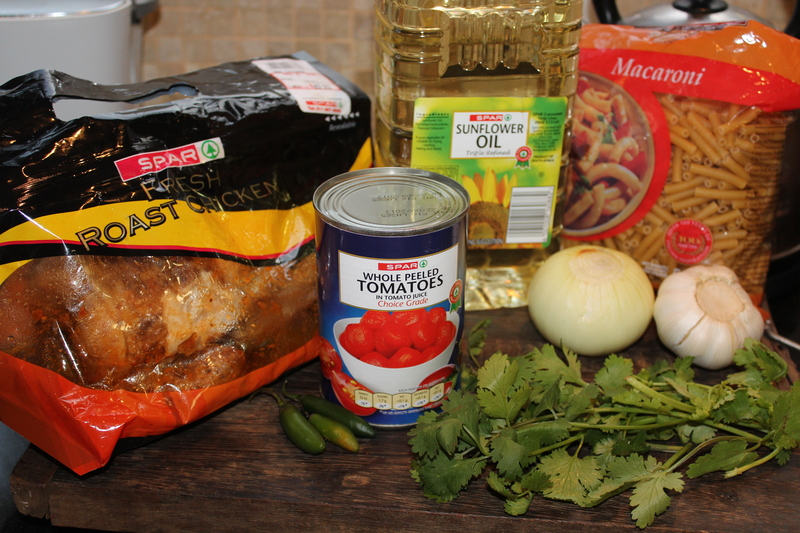 Its no secret that I have become a Spar shopper as I am usually in store about four times a week to either promote my range of spices, Curry Me Home, or as the guest chef. I grew up in a home where we never experimented with new foods and new brands. We bought what we knew and what everyone else was buying. But only buying what you are familiar with can deprive you of many new opportunities. One thing I have learned from my travels is that South African consumers are not only spoilt for choice, but the choices are often great quality at reasonable prices. Maybe we don’t realise this because we have been brain washed by the generations before us. Yes, we are a Sunlight Liquid, Handy Andy and Lux Soap society! Is it time for a change? Look around! Try new products!! Anyway, back to the troublesome tomatoes…even the local Fruit and Veg City only had the greener under- ripe firm tomatoes, so my assistant, the lovely Nothando, picked up a few tins of the Spar brand ‘Whole Peeled Tomatoes’ when she was doing my shopping. I got home really late and only had about fifteen minutes to prepare dinner. I rummaged through the refrigerator and found a leftover chicken which needed some rescuing. Being short on time and without fresh tomatoes, I reluctantly opted for the tinned variety instead –my happy learning experience for the day! Also, I am trying to make fewer creamy sauces these days – I do get the evil eye from Rob when I use cream…he says its his cholesterol trouble. I think its more likely a lot to do with my curvy new look! Here’s how I made a speedy dinner in ten minutes…. And if you want to spice things up…..
Heat the sunflower oil in a thick bottomed pot. Add the onions and coarse salt. Saute until the onions are translucent. Add the crushed garlic and fry for a few seconds until fragrant. Add the chopped tomatoes and stir for a few seconds. Use a wooden spoon to break the tomatoes down. When the tomatoes soften, pour in the wine and simmer for a 2 minutes. Add the deboned chicken and the Magic Masala. Simmer until the chicken is heated and the wine has evaporated. Chop the fresh coriander and sprinkle it over the chicken. Place the chopped chillies, olive oil and salt in a little bowl. Stir well to combine. Leave aside to infuse for a few minutes. 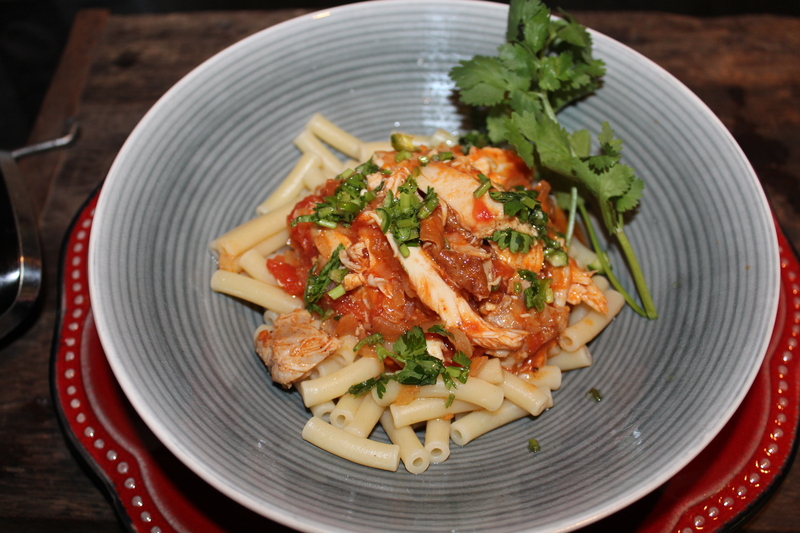 Serve the chicken on a bed of pasta or rice (I used macaroni – this was my only option). Spoon some of the ‘Grown Ups Drizzle’ over if you want to spice the chicken up. I think Nothando is an angel for picking up the Spar tinned tomatoes…I am thankful that she puts up with me. When in doubt, add tinned tomatoes rather than cream – it works and its so much better for you. Old is not gold in the foodie world so give some new brands a bash. Trouble, trouble trouble….I remember my mom’s Greek friend, George, asking me to prepare an Okra dish for him when I was just a cub chef. I was about 17 years old at the time and had not even tasted this vegetable before. I completely panicked…there was a time in our lives when Google did not exist and recipe books where not as popular as they are now! I tried to prepare a dish with okra and chicken – needless to say, it was a disaster. I plated up my disaster and watched as my mom and George stared at it with horror. George had a good old laugh about the sticky, gooey mess. My mom, however, was clearly not impressed. My mom and George never asked me to cook an okra dish again….in my book, this is the best ‘happily ever after’! The trouble with okra is that it can be so sticky and unappetizing if it is not cooked properly. Actually, even the simplest of ingredients can turn into a cooking disaster. Okra is also known as Lady Fingers or Bhindi and is popular in Indian, African, Middle Eastern and Mediterranean dishes. It is also used in the classic American gumbo. I prefer the crispy fried version to the gooey, glutinous consistency of stewed okra. When buying this versatile vegetable, ensure the pods are fresh by bending the tip. They should snap easily and not be soft. Also choose the younger, tender pods as the older ones can be very chewy. Here are some quick tips for preventing okra from becoming sticky: I slice the okra and place it on a tray. Leave this to ‘dry out’ for about an hour before cooking. Add salt after the okra has been cooked when making a stew, curry and casserole. Fry the okra and add sprinkle it over a cooked curry or casserole. Here is my recipe for Crispy Okra which can be served as a snack or a side dish. Wash the okra under cold running water. Place the okra in a colander and leave to drain. Wipe off excess water with absorbent paper towel. Slice the okra pods and spread out on a tray. Place the basmati rice into a coffee grinder and process until fine. Combine the ground rice and chickpea flour in a mixing bowl. Add the onion seeds, ground cumin, turmeric, red chilli powder, dried mango powder and salt. Add enough cold water to make a thick batter. Coat the okra in the batter. Heat the sunflower oil in a thick bottomed pan. Drop the okra into the hot oil using a tablespoon. Fry the okra for a few minutes until golden brown. Drain in a colander and dab off excess oil with absorbent paper towel. 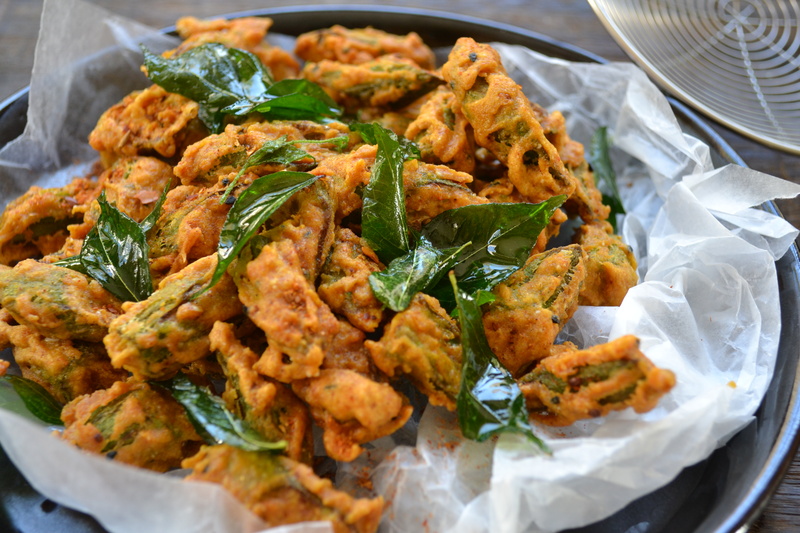 Fry the curry leaves until crispy and place them over the fried okra. Serve immediately. Long grain rice can be used in this recipe. Fry the okra in batches to ensure that they are crispy. Dried mango powder can be purchased at Indian grocers and spice stores.